In OpenStack, the networking is managed by a component called “nova-network”. This interacts with nova-compute to ensure that the instances have the right kind of networking setup for them to communicate among themselves as well as with the outside world. Just as in Eucalyptus or AWS, each OpenStack instance can have 2 IP addresses attached to it. One is the private IP address and the other called Public IP address. The private IP address is typically used for communication between instances and the public IP is used for communication of instances with the outside world. The so called public IP address need not be a public IP address routable on the Internet ; it can even be an address on the corporate LAN. Cloud computing is a computing model, where resources such as computing power, storage, network and software are abstracted and provided as services on the Internet in a remotely accessible fashion. Billing models for these services are generally similar to the ones adopted for public utilities. On-demand availability, ease of provisioning, dynamic and virtually infinite scalability are some of the key attributes of cloud computing. Amazon Web Services (AWS) is one of the major players providing IAAS. They have two popular services – Elastic Compute Cloud (EC2) and Simple Storage Service (S3). These services are available through web services. There are several pre-built images for OpenStack available from various sources. 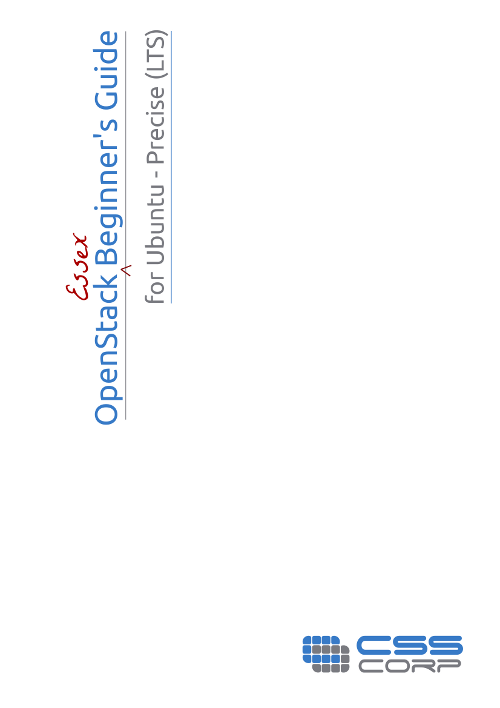 You can download such images and use them to get familiar with OpenStack. You can refer to http://docs.openstack.org/cactus/openstack-compute/admin/content/starting-images.html for details on using such images. The following section describes how to set up a minimal cloud infrastructure based on OpenStack using 3 machines. These machines are referred to in this and subsequent chapters as Server1 and Server2 and Client1. Server1 runs all the 7 components of Nova as well as Glance and OpenStack dashboard. Server2 runs only nova-compute. Since OpenStack components follow a shared-nothing policy, each component or any group of components can be installed any server. Canonical has recently joined OpenStack consortium and has started working actively on adding OpenStack support in Ubuntu. Encouraged by the way users of UEC received our “Eucalyptus Beginner’s Guide, UEC Edition”, we have started working on the book “OpenStack Beginner’s Guide for Ubuntu 11.04, Natty Narhwal” and hope to release all the chapters of the book soon here as articles followed by a pdf version of the book. V2.0 of Eucalyptus Beginner’s Guide – UEC edition is out. This covers UEC on Ubuntu 10.10 Maverick Meerkat, based on Eucalyptus 2.0. Please download the PDF and post your comments.